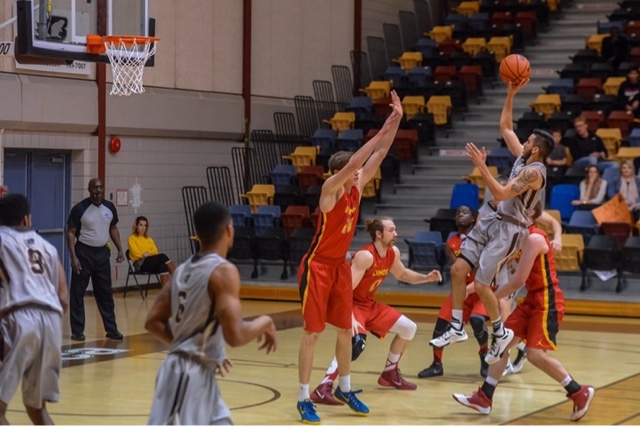 In men's basketball, #9 Manitoba lose in Canada West Final Four semifinal by 100-74 score at #4 Calgary. Bisons will play for conference bronze medal on Sat., March 12 but have no opportunity for 2016 CIS championships berth now. The University of Calgary Dinos may have started slow in their Canada West semi-final game against the Manitoba Bisons, but ended up winning the rest of the way for a 100-74 victory on Friday, March 11. The Dinos will now host the championship game Saturday night at 8 p.m. MT, looking for their first championship since 2009 while the Bisons will play UBC Thunderbirds in the bronze medal at 6 p.m. MT. With the win, Calgary clinched a CIS championships berth while Manitoba was denied their chance to play for a national championship with the loss. Conference MVP Thomas Cooper led the way once again with 27 points and eight rebounds, but he got plenty of help, as David Kapinga, Jasdeep Gill and Jhony Verrone also hit double-figures. It certainly didn't like there would be a blowout early in the game, as the Bisons came out strong, jumping out to a 6-0 lead, eventually pushing it to 14-4 and silencing the Dinos home crowd. But then Calgary woke up. The Dinos got big contributions from Verrone and Jasdeep Gill off the bench, as a Verrone three would give Calgary their first lead at 21-20 with a 1:30 left in the quarter. Cooper would score four more points to end the quarter and the Dinos led 25-20 going into the second and wouldn't give up the lead the rest of the way. Calgary would push it to a 10-point lead after a Kapinga layup 30 seconds in the second, but Manitoba would cut it to 35-31 around midway through after a Keith Omoerah score. But the Dinos took the punch and kept rolling as Kapinga would score seven straight points to push the lead to 41-32 and Calgary would be up 51-42 at halftime. The third quarter was similar to the first, as Calgary got off to a slow start once again and Manitoba would get as close as 53-50 at the 6:23 mark. However, Calgary would find its groove again and was up 71-56 going into the fourth. The final quarter was more of the same from the Dinos, as they cruised to the 26-point win. Manitoba simply couldn't stop Calgary, as the Dinos shot 50 per cent for the game, going 8-18 from three-point territory, whereas the visitors shot just under 37 per cent along with a rough 5-20 from downtown. Kapinga had another strong playoff game, with 23 points, five rebounds and five assists, while Verrone and Gill both scored 11. Manitoba's A.J. Basi finished the game with 17 points to lead the Bisons in scoring, but he was held to zero in the second half, while Justus Alleyn and Brett Jewell also finished in double-figures. Calgary will now play Thompson Rivers for the Canada West title, after the Wolfpack beat UBC 72-69 in a comeback win in the first semi-final. Both teams earned a CIS berth with semifinal wins on Friday.